Complete kit for male skin care. 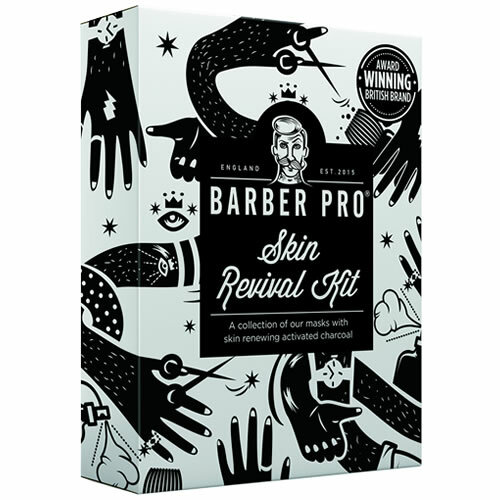 The Barber Pro Skin Revival Kit is designed to purify the face and brighten and rehydrate the skin, giving your clients an intensive set of treatments in one handy kit. The treatments use ingredients like activated charcoal and collagen to revive your clients' skin. £7.20 (inc. VAT) Why no VAT? We're a trade wholesaler and quote our prices without VAT to help our VAT-registered customers understand the true cost of a purchase. Age-defying hydrogel under-eye masks that utilise marine collagen, combined with key vitamins, herbs and botanicals to improve skin clarity, tone and elasticity. Comes in a sachet containing 3 pairs of masks. Also available in boxes of 12 sachets. Pack of 3 bars of colourful, great-smelling soap that are quick to make a luxurious lather. Kit contains Classic Ice Soap, the Big Blue Bar of Soap for Blokes and Cuban Gold Soap. They weigh 175g each. 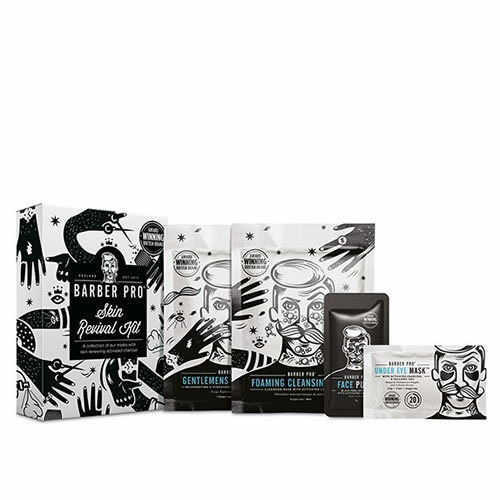 Innovative sheet mask to cool and nourish the skin after a wet shave. Simply apply to face and neck to soothe and hydrate. Contains tea tree, witch hazel and anti-ageing collagen. Available singly or in retail boxes of 12 or 24. An effective eye mask that rebalances, hydrates and detoxifies skin in one intense 10 minute treatment. It's free of Mineral Oils, Lanolin, Petroleum and Parabens and comes in a 7-g sachet, 90-g tube or a pack of 12 sachets. Wonderful detoxifying self-foaming sheet mask that offers a micro-massage to the skin that cleanses away impurities. It's suitable for all skin types and is cut to the shape of the lower half of the face. Comes in an 18-ml sachet or a pack of 12 sachets. An anti-aging and firmness-boosting collagen mask that offers a rejuvenating and hydrating treatment for the skin. It's free of Mineral Oils, Lanolin, Petroleum and Parabens and is suitable for all skin types. Comes in a 23-g sachet or a pack of 12 sachets.